The first promotional pictures of Michael Keaton in the Bat-suit calmed fandom’s collective jitters, though there still was controversy over a comedian cast as the Dark Knight. I was very happy with Tim Burton’s vision of the Caped Crusader though I must confess that I had a little bit of anxiety myself as walked into the Kambe Theater in June of 1989. I had been a fan before the 1966 TV, my interest having started in the very short and often over-looked “New Look” era of 1964-65 when Julius Schwartz and Carmine Infantino changed the big goofy Batman of the Fifties into a coolly effective detective. While at first I was thrilled when the TV show came on the air in the winter of 1966 it didn’t take long for me to discover that I wasn’t going to be seeing the same serious hero I had start reading about in the comics with “The Mystery of the Menacing Mask” in Detective Comics 327. Thankfully the Keaton incarnation was more like that “New Look” detective than the earlier Bat-boy Scout. 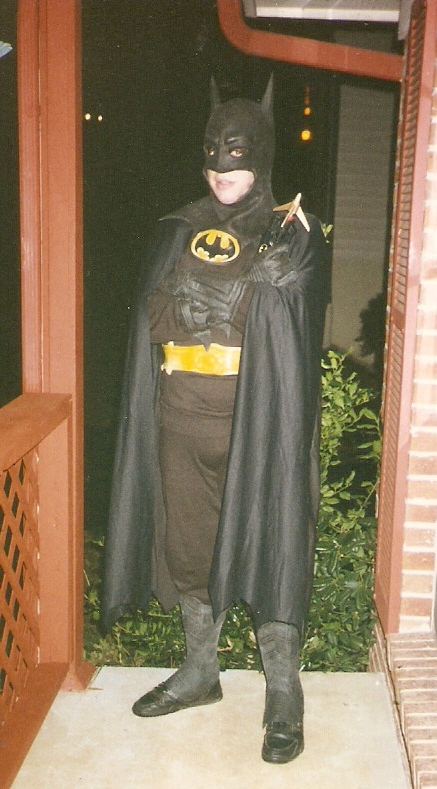 …so it should be no surprise that I soon after the new movie I had plans for a Batman Halloween costume, though time and money delayed my efforts until the fall of 1992. I built my outfit around the mask, gloves, utility belt and leggings from the Don Post costume but opted for black sweats and a generic black cape instead of the body suit, which according to Lori made me look like Kevin Nealon and Dana Carvey in their “Hanz und Franz” costumes from Saturday Night Live. With a garage-kit batarang picked up at the WORLDCON dealer’s room and a toy grappling hook gun detailed and painted to match the movie device completing my kit I stationed myself at on our front porch with a large basket of treats and waited for the first trick-or-treaters to arrive. Between the costume, the treats and the buckets of dry-ice giving off swirling wisps of vapor we were the hit of the neighborhood and soon word of mouth had families detouring from the adjacent subdivisions to see “the real Batman”. We had so many kids come by that we had to ration our treats eventually borrow candy from our neighbors. I had my picture taken several kids and traded quips with several Jokers, Penguins and Catwomen, always striving to keep my voice gravelly while I stayed in character and staying on my feet to avoid the “midriff bulge” that would appear whenever I sat down. It seemed like there was no end to the trick-or-treaters stopping by the house but finally their numbers started to dwindle giving us gaps between groups. At one such break I was just starting to sit down when I caught just the slightest bit of movement out of the corner of my eye and I stood straight up again. It’s difficult to see anything out of that mask and hearing anything is just as bad or worse. I called out, inviting the mystery party up to the porch but nothing happened for a couple of minutes. Finally a young house-wife walked up to the porch; she said they were from just over the hill in the Fair Oaks subdivision and that her five year old son was with her – but that he was too scared to come any closer than the street curb just out of the light. She went on to say that he was also wearing a Batman costume….but thought I was the real Batman and that I would be mad at him for copying me. “You know, there’s a lot of crime in our cities. I’m so busy in Gotham City that I can’t always take care of what’s going on here in Knoxville so I need lots of helpers. I’m glad to see you in costume because we need more Batmen”…and to this day I swear the little guy grew an additional inch or two right on the spot as he puffed up his chest and walked off with a swagger into the night, his mother mouthing a silent ‘thank you” as they headed up the hill to finish their circuit of the subdivision. That was the last year for the Batman costume for me. My two sons – and then later our neighbor’s grandsons all got some mileage from the outfit but when the next Halloween came around it was obvious that I made a transition from the Michael Keaton category to the Adam West version so I hung my cowl for good. Fifteen years later I didn’t even look as good as Adam West. I was eight years into the ravages of ankylosing spondylitis with acute rheumatoid arthritis inflaming those joints that the A/S had missed. I looked bad and my yard looked even worse, prompting snarky comments from one of our neighbors. I did my best to keep the yard in decent shape but with my sons married and gone it would have been challenging to do even if I hadn’t been struggling with my assorted autoimmune disabilities. I was fighting with the hedge-clippers one sunny day when a young man stopped and asked if I needed help. It surprised me; in the years we’d been living in our subdivision we’d seen the area sadly drift from a place full of starter-homes with young families to a downwardly-mobile area with too many rentals, and my first reaction when the young man stopped to talk was to wonder if he was casing my house for a later burglary. I was delighted to discover I was wrong as the youth returned several times to help with various landscaping chores over the next couple of months. In addition to keeping the lawn up he cleaned out the rain gutters, trimmed the hedges, pruned the trees and generally kept the place in tip-top shape. He also made it very hard for me to pay him. I’d write a check and he’d decline, saying he didn’t have a bank account so he couldn’t cash it – which was a source of concern to me until he showed the same reluctance to take cash. I’d bring out $20 in various bills and he’d take just a fiver or he’d just tell me to pay next time. ..then unexpectedly job offers appeared that were going to move us out of Knoxville and my attention shifted from yard work to packing, cleaning and selling the house. At that point I lost contact with the young man, and he didn’t come to mind again until about a month ago when I was going through photo albums and chanced upon my Batman shot. It was then that I realized that I had never even known my youthful benefactors name, just that he lived “over the hill in the Fair Oaks subdivision” and the first time he stopped by he had commented that I looked I was having a hard time: “taking care of what was going on with my yard and needed a helper”. Was the twenty-something landscaper the five-year old Batman from all those years ago? It added up in terms of years but I was hesitant at first because it seemed so neat and clean like a story from Reader’s Digest, The Ensign – or like the 60’s Batman episode wherein Robin wonders aloud about the miraculous way the two of them escape complicated death-traps week after week. In the end I decided that the five year old Batman and my twenty-something handyman were one and the same. I may be swimming in Egyptian waters ( in “de-Nile”) but it all sits with me much better to think that in a time when everyone is wringing their hands and moaning about the overpowering self-absorption of the Millennial generation there is a least one member of that group who remembered and returned good for good.